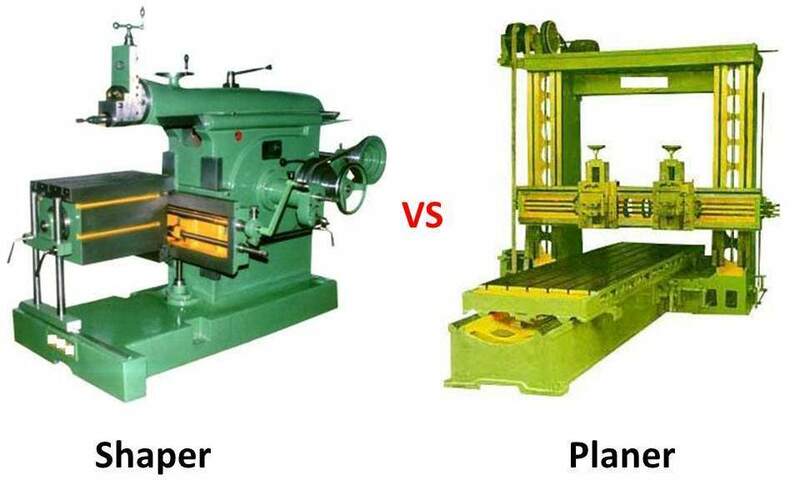 When we talk about difference between shaper and planer, one thing strike our mind that both are different name of a same machine but this is not true. Both shaper and planner are used to make flat surfaces, cut slot and grooves and also use to make concave and convex geometry but there are some key differences which separate them from each other. The basic and main difference between shaper and planer is that in shaper machine work piece is fixed at the table and tool is in reciprocating motion which rub the work piece and cut unwanted metal. It is used for small size work piece. But in planer machine tool is act like as stationary body and work piece move over it. It is used for large size work pieces. There are many other difference which are described below. Shaper is used to machine small work piece which can fit on the table. It can work with large size of work piece. Tool is the moving part in shaper machine. Work piece is the moving part in planer. Work piece remain stationary on this machine. Tool remains stationary on planer. It is light duty machine. It can use only one cutting tool at a time. It is equipped more than one cutting tool at a time. It uses single point cutting tool. It also used single point cutting tool but more than one tool can be used at same time. modern machine hydraulic drive is also used. It gives poor accuracy compare to planer. Shaper is smaller in size and gives slow cutting speed. It is not suitable where productivity is prime concern. It is larger in size and gives large productivity. The stroke length can be adjustable. Stroke length can be adjusted. Today we have learned about key difference between shaper and planer. If I have missed some, kindly inform me through commenting. If you like this article, don’t forget to share it on social networks. Subscribe our website for more informative articles. Thanks for reading it.